I’ve now passed the 6-month mark at FutureGov. 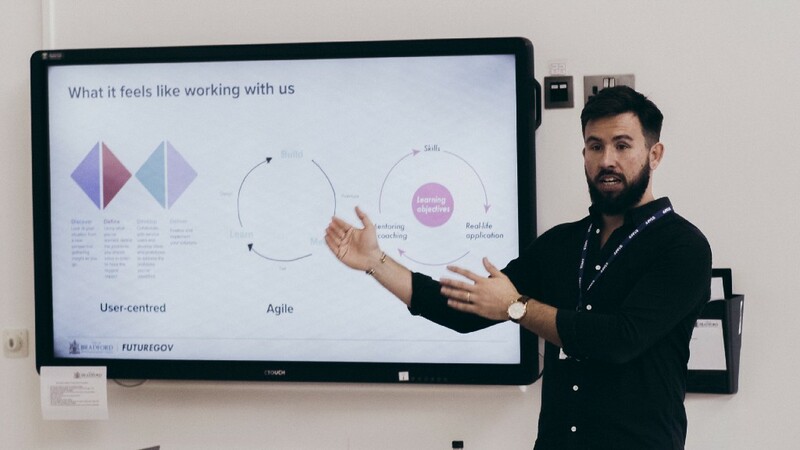 When I first arrived, I wrote about what it means to make the move from local gov to FutureGov. Now, it feels like a fitting time to reflect on a few of the key things I’ve learned about what works well for the council’s we work with, and about my own journey. The use of visual prompts is more important than I’d anticipated in helping people understand the new and different concepts we share. The old adage of ‘a picture paints a thousand words’ rings so true. Having a series of artefacts that help tell the story of our work, both for the people we work alongside and for our own institutional memory and challenge, is a great thing. This was brought to life when we created the emotional journey map for the Adult Services Review in North East Lincolnshire. Seeing the key points in a persons attempts to access support and drawing parallels between those moments and choices made by the provider, meant council staff could see the human implication. It was a lightbulb moment for them, and for me. Like everyone, I’ve worked in good teams and not so good teams. Today, I’m lucky to be surrounded by exceptional colleagues, who also happen to be effective lone operators. However, while setting a vision and knowing that they can deliver is good, there’s nothing quite like coming back together as a multidisciplinary team. We choose to make space for empathising with one another and pushing each other to be even better. Seeing the power of bringing together different disciplines — from strategy to delivery to design — and using them to unlock new and different conversations for staff is amazing. This culture has me reflecting on the fact that we talk about the value of multidisciplinary teams with our clients, but we also live and breathe it, day in and day out. Vulnerability is a strength. Despite being a senior member of FutureGov, I’m not expected to have every answer. Coming from a background predominantly in local government, this has been a breath of fresh air. I’m able to openly say ‘I don’t know’ or ‘I need help’ without feeling like I’m undermining myself. It’s a fantastic, utterly liberating feeling that makes me unafraid of trying even harder. Once, I had an upcoming meeting with no ideas (we’ve all been there). Using Slack, I reached out to our hive mind for good ideas and examples to help frame this conversation. Within half an hour, I had a Google doc overflowing with amazing ideas and pointers I could use to make the case. There are so many occasions like this when we each get to give back. I now know that the point of the work, and possibly even the point of life, is about being generous with what I know and asking for help when I don’t. In an update to the saying “time flies when you’re having fun”, I think it soars when you’re learning at the same time. It feels like I’ve been a part of the FG family for years, whilst also feeling like it’s gone past in the blink of an eye. I’ve done my best to draw on the collective experience, intelligence and insight from everyone I’ve met and worked with so far. The feeling of being a human sponge can be tiring. But I’m more aware than ever that when you stretch yourself, you grow. Not everything has to be a huge, revelatory act of learning. Sometimes it’s the small things which are significant, and it’s only when you add them up that you realise how far you’ve come. As ever, I’m a work in progress, so look forward to adding to this list over time and to seeing it, and myself, evolve. A constant work in progress was originally published in FutureGov on Medium, where people are continuing the conversation by highlighting and responding to this story.